The Daily GRRR! HEADLINES for April 2nd, 2015. 1. Direct Action By Heiltsuk Force DFO to Re-Close Commercial Herring Fishery. 2. The US EPA Confirms That Toxically Diluted Tarsands Sinks In Water. 3. BC NDP MP Presents Anti-Pipeline Petition in Parliament. 4. TransCanada Drops Plans For New TarSands Export Terminal In Quebec. 5. Smashy Retaliation Against McGill For Spying on Students. 6. KW Solidarity Network Pickets At Kitchener's Revel Developments. Welcome, I am your host dan kellar and you are listening to The Daily GRRR! on 100.3fm, CKMS in Waterloo, Ontario. Soundfm.ca on the web, today is Thursday April 2nd, 2015. The intro music is from the start of The Rebel Spell's Tsilhqot'in War. 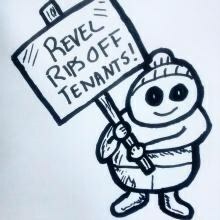 Today’s feature is an interview w/ Holli-Lynne of the KW Solidarity Network who is targeting Kitchener based housing rental and development company, Revel Developments after the company refused to pay agreed upon fees associated with the reno-viction from her apartment. @HeiltsukCouncil: "Commercial GillNetters are being escorted out of Heiltsuk Territory! #Heiltsukherring!! Thank you to all who have made this possible!!! The nation, whose territory is on the pacific coast in the north west of turtle island, had declared the herring stock still in recovery and earlier this week, and in accordance to their laws, told the Pattison commercial fishing fleet that they were not welcome in their territory. Last week, members of the Heiltsuk nation, confronted the fishing fleet who was being protected by RCMP boats, and on Sunday, a group led by youth confronted the DFO, and started an occupation of the local DFO office. While commercial fisheries kill Herring fish to collect their precious roe, the Heiltsuk method of harvesting roe is through a targeted harvesting of deposited eggs from sea kelp. While the commercial method leads to the devastation of herring stock, along with impacts to other sea creatures, the Heiltsuk's method has proven sustainable for generations. Protests throughout BC quickly sprang up in solidarity with the Heiltsuk, and the DFO confirmed that the fishery is again closed, and the celebrations are ongoing. "Fleet been escorted out of Heiltsuk territory No fishery in area 7!! #Heiltsukherring #standingstrong"
At this year's National Academy of Sciences conference, there were dueling reports over the impacts of dilbit to water systems, and in particular the buoyancy of diluted tar sands in water. As the deSmogBlog reports one paper, presented by Greg Powell of the U.S. Environmental Protection Agency, says that after 2 weeks, the tar sands that flows from a ruptured pipeline, or a derailed train tanker, into a water source will sink. The other report, funded by a fossil fuel industry think tank, says tar sands does not sink after the toxic diluent diffuses into the air. Of course that study, as well as a 2013 study funded by Enbridge ended the testing after 13 days. Powell was involved in the clean-up efforts after the 2010 rupture of Enbridge's Line 6 pipeline in Marshall Michigan, which led to 60 miles of the Kalamazoo river being contaminated with tar sands, and neighbouring houses being doused in toxic airborne dilutants. Similar in age and construction to the Line 6 pipeline in Michigan, the Line 9 pipeline travels through all of southern ontario, passing through waterloo region and across the Grand River near Cambridge. As enbridge continues to move forward in their plan to pump tar sands through Line 9, and with the limitations and deceitful spin that the fossil fuel industry puts on their so-called studies, we can not simply trust them to keep the safety of our watershed ahead of their profits. A petition with 3000+signatures against the expansion of the Kinder Morgan pipeline through Burnaby was presented in the canadian house of commons on March 25, calling on the federal government to oppose Kinder Morgan's tarsands pipeline expansion. Saying "The signatories note this export-only crude oil pipeline brings massive environmental and economic risk but no real benefits for local residents. This is without a doubt the No. 1 issue facing Burnaby, and my office has never received so many petitions before from constituents," Kennedy Stewart, the NDP MP for Burnaby-Douglas added in the house of commons "While I know the Conservatives and Liberals both support the new Kinder Morgan pipeline, I urge the government to take this call to oppose this pipeline very seriously." The government has 45 days to respond to the petition and is awaiting the decision from the NEB on approving the proposed pipeline expansion. Even if the NEB takes the remarkable step in opposing the pipeline, their decision can be overridden by the government's cabinet, following changes to legislation introduced by Harper. Following months of speculation, on Wednesday transcanada pipelines confirmed today that they are scrapping plans to build a new terminal on the St Lawrence River to export diluted tarsands crude to overseas markets. The plan was fiercely opposed by many in quebec including those concerned over the impact on Beluga whales due to the destruction of their habitat and the inevitability of spills. The export terminal would be an end point of the proposed energy east tarsands pipeline. The company now says they will use an existing export terminal in New Brunswick. In a follow up to last week's headline and interview about the ongoing campaign of Demilitarize McGill to resist and expose the military industrial complex on campus, it has been revealed through access to information requests, that the university's admin has ordered security to spy on DeMil Mcgill activists. In retaliation for these revelations, and in solidarity with those in Demilitarize McGill, the group known as the Anti-Imperialist Action "slashed the tires of a McGill security division SUV and attacked the James Admin. building with flying chunks of concrete, vanishing quickly thereafter into the darkness of night." The AIA claimed responsibility for the actions 'in retaliation to the University’s profiling, surveillance and harassment of students and activists affiliated with the group Demilitarize McGill." The communiqué added "In honor and recognition of the fact that we share a common struggle against the same system and the same authoritarian social institutions, we took action to make it clear to our enemies that Demilitarize McGill is PROTECTED." In an escalation to their campaign against rental and development agency Revel Developments, on Wednesday, the KW Solidarity Network picketed in front of the company's Kitchener offices. The KW solidarity network wants Revel to pay nearly 3000 dollars owed to a former tenant who agreed to move out during a phase of gentrifying reno-victions the company was undertaking after buying the building she was living in. During the winter time renovations, electricity, water, and heat were all continuously shut off. It has been nearly a year and Revel has thus-far refused to honour the agreement. For more on this situation stay tuned for today's feature, which is an interview with Holli-Lynne, a member of the KW Solidarity Network and the person who Revel Developments is trying to rip-off. Thats all for headlines, lets take a little break and go to a song, here is a tune from Run The Jewels feat. Zack de la Rocha, this is Close Your Eyes (And Count To F**k). You are listening to the The Daily GRRR! Today is Thursday April 2nd, 2015 and my name is dan kellar and we are now moving into the feature portion of our broadcast. That was an interview w/ Holli-Lynne of the KW Solidarity Network who is targeting Kitchener based housing rental and development company, Revel Developments after the company refused to pay agreed upon fees associated with the reno-viction from her apartment. Check http://kwsolidarity.com/ for more on this case and other work of the KW Solidarity Network.